Malapascua Island tourist industry is known for its majestic diving tourist attraction. Philippines is one of the top 5 countries with high shark diversity found in Donsol, Sorsogon; Manta Bowl in Ticao Pass; Cagayan de Oro and Malapascua Island, Cebu. Cagayan de Oro has the highest concentration of megamouth shark strandings, Three kinds of sharks can be found in our waters. These are: big eye thresher, pelagic thresher and common thresher. Philippines is the only country that has an established pelagic thresher shark dive industry. Sharks grow slowly, and have a small number of young per brood. With the high demand for shark fins that end up in the restaurants, not to mention shark products in pharmacies and other industries, sharks become vulnerable to overfishing. This is the reason why my family and I refrain from patronizing sharksfin soup, shark oil, leather, jewellery and other shark byproducts. With dimishing demand on these products, we may be able to help conserve these species. Sharks are at the top of the ocean ecosystem and so removing them may cause the whole structure to collapse. A food chain minus its apex predators would mean the end for some lower species. Shark depletion will result in the loss of important fish and shellfish species down the food chain. Big fishing companies have lots of money to coerce decision makers into passing legislations generally against the best interests of shark populations. the only way to go head to head with these companies is by raising awareness. The conservation of these species lie in our hands. But how can we protect these sharks? Signing a petition is something you and others can do to jointly achieve this. These small actions are significant in shark conservation. 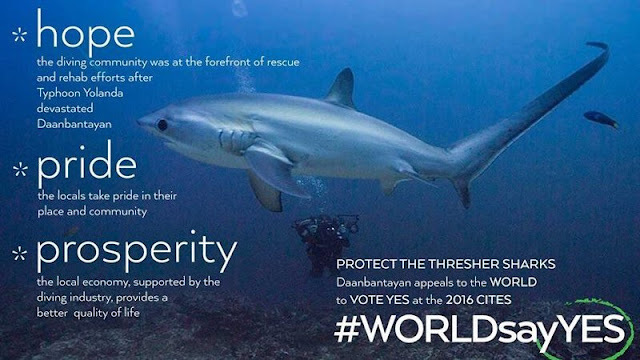 Make a difference by signing A PETITION to include Malapascua’s thresher sharks on the world’s endangered species list! Let all Filipinos unite to push for the protection of the thresher sharks! 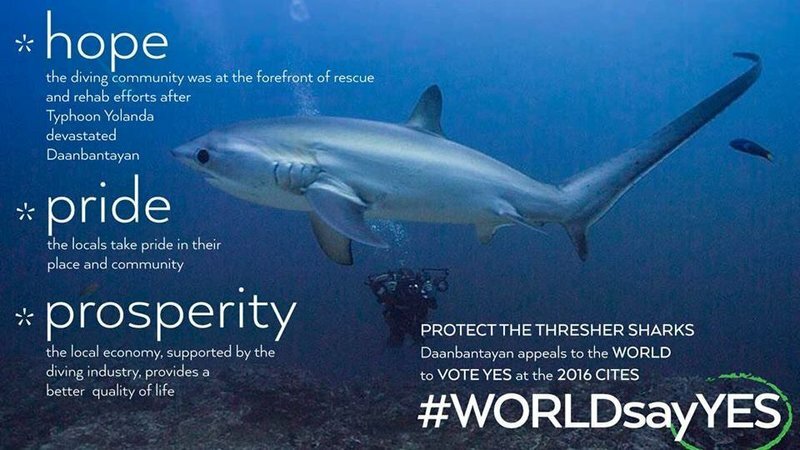 The Philippines’ YES vote is important for thresher shark conservation. This platform will help to promote one of the world’s most sought-after dive experiences and secure our future generation's opportunity to see the pelagic thresher sharks in Monad Shoal. We can make all these happen by signing in the Petition and Voting YES for Threshers at Change.org! Do join in the Thresher Shark Campaign and stand up for Shark Protection! Log in at https://www.change.org/p/philippines-vote-yes-for-threshers and VOTE NOW!